Are urban trees really worth the investment? The recent situation in California regarding the removal of approximately 400 trees, chronicled in this article in the LA times http://latimesblogs.latimes.com/lanow/2012/09/shuttle-endeavour-nearly-400-trees-to-be-axed.html has made me think about trees in our urban conditions and how much we really value them. In return for the Endeavor’s trek to the California Science Center requiring the removal of the trees, the Science Center has agreed to plant new trees, perform sidewalk repair, and provide more scholarships and job training. There has been a fair amount of research on the development of a methodology for the evaluation of trees. I thought it would be interesting to take a quick look at the simple economics of trees in urban conditions and some designed solutions that can increase the return on investment. Anyone can clearly see the environmental benefits of trees and it would be difficult to argue against the benefits trees provide to our health and well-being. Universal Studios and Illumination Entertainments recently released a remake of the Lorax http://www.theloraxmovie.com/index.php in which air becomes a commodity and a community is built around the availability of air. In the end, the greatest loss in the Lorax is a deeper connection with nature and habitat, something that is extremely hard to put a value to. So, I’ll put aside the environmental benefits of trees and will focus on purely economics. The USDA Forest Service has done studies indicating that trees can increase a property value on average by 10%. Studies done by Kathleen L. Wolf indicates that shoppers in large cities are willing to pay 12% more and 9% more in smaller cities for comparable products in areas with an urban canopy as opposed to areas without one. (Kathleen L. Wolf, “The Environmental Psychology of Shopping, Assessing the Value of Trees”, Research Review, Vol.14, No.3, 2007). Using a simple example, the purchase and installation price of a 2.5”-3” caliper tree would be roughly $1000.00. 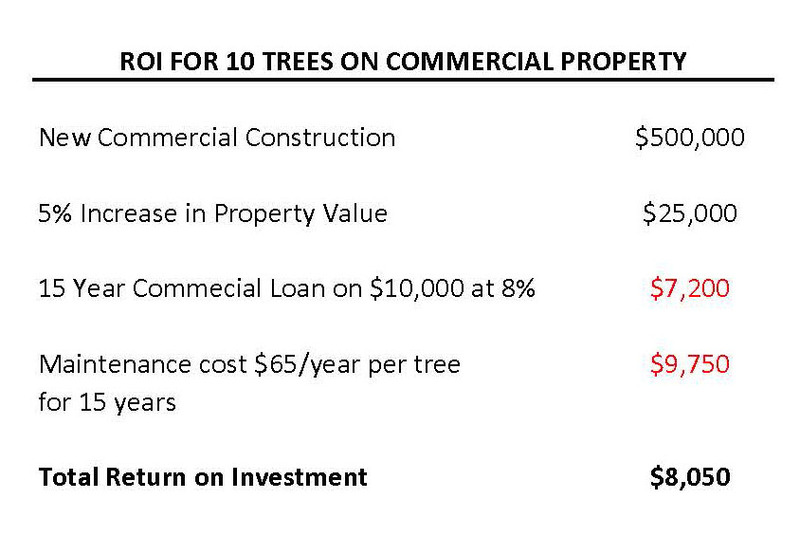 If you consider a new commercial building with a construction cost of $500,000 and as part of that cost ten trees are planted which equal $10,000, the increased property value of those trees, at a conservative 5%, would be $25,000. On a 15 year commercial loan at an 8% interest rate, the terms of that loan would add an additional $7200 in interest. Adding in maintenance on the trees at $65 per year, per tree we come to $9750 for a total expenditure of $16950. This provides a return on investment of $8050 or almost 80%. It seems like a great return on investment, so what is the catch? 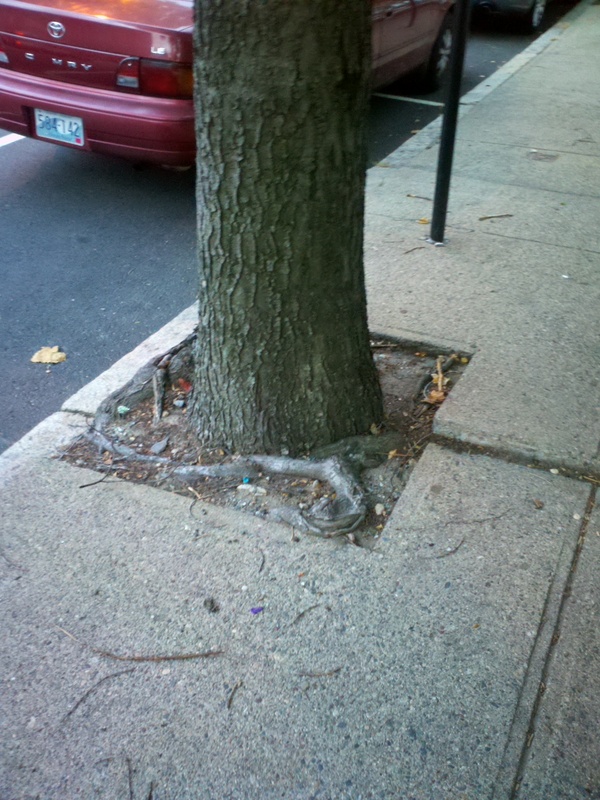 There are some pitfalls in the equation; the average urban tree only lives 13 years. If you had to replace each of those trees within the 15 year loan period and ignoring inflation your return on investment would be -$1950 or -20%. 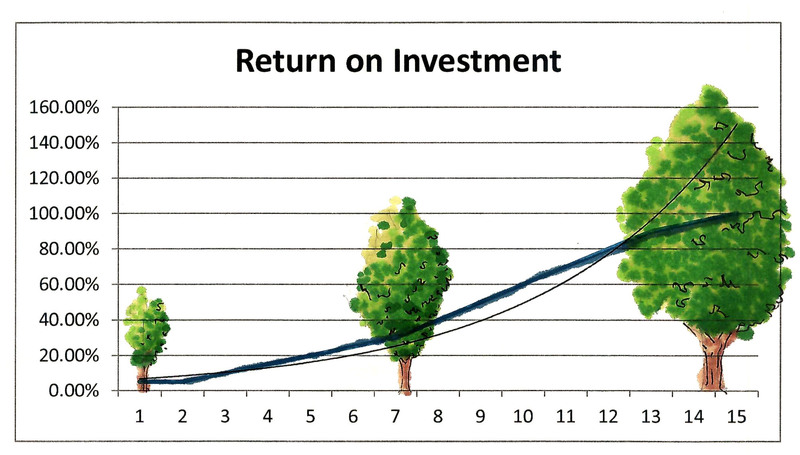 For every tree lost you would lose 12.5% of your return on investment. It should also be considered that the return on investment through increased property value also is not based on immediate returns. Planting 2.5”-3” caliper trees does not equal an instant 5% increased property value. The longer and more mature a canopy is the higher the return on investment, up to 10% increase in property values found in the USDA study essentially doubling the investment outlined in this example. There are no gains by having 10 half dead trees out in front of a property. If trees provide a great return on investment to a property, either residential or commercial, why are they continually planted in such terrible conditions? As seen below, you can walk down any city street and find dozens of examples of trees that are destined to fail from the start. 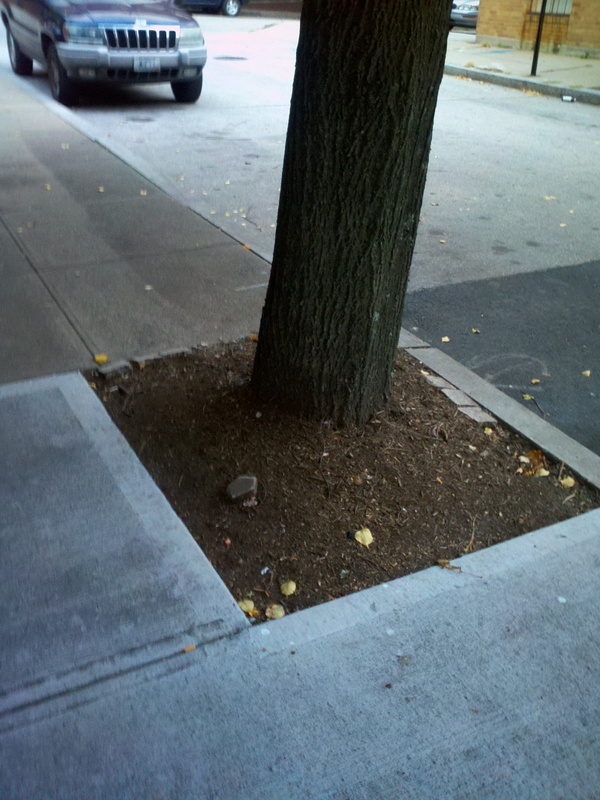 A few causes include trees planted in pits that are too small leading to damaged sidewalks and maintenance issues down the road, compaction of soils around the trees because of improper soil protection and damage to the trees themselves caused by improper maintenance and cultural practices. All of these lead to a decrease in ROI. There are a range of solutions to protect an investment in trees. In areas were available soil space is limited, engineered products like Silva Cell by Deep Root limits compaction through a structured base opening up more area for root growth. Another solution is structural soils providing the appropriate mix of gravel and loam to allow for the expansion of root growth while maintaining the structural integrity of the soil to support pavements above. It can also be as simple as expanding the size of tree pits to give enough room for trees to grow, and providing proper training to maintenance staff on the best practices for tree-trimming and fertilization. All of these efforts can greatly extend the life of trees. and in turn increase the ROI. Landscape Architects, when brought into a project early can work with the architect and developer to create a plan to allow for proper and sustained tree growth. In the end, when planning for trees is not considered from the beginning the economic benefits of trees are lost and only leads to headaches down the road. A BUILDING WITH NO CARS?